Install helical ground anchors as close to the building as possible at all four corners. using a straight rod to screw anchor into the ground. A starter hole, up to 1/3 of the anchor length can be used to start powder coated spiral ground anchor into the ground. Once the anchor eye is level with the ground, back fill the soil and pack area around the anchor eye. Anchor eye should be just above soil level. Attach one end of the cable to an anchor using the Wire Rope Clips. Cable goes through the anchor eye and clamped together using the wire clip. Place the cable over the roof to the opposite anchor, loop cable through anchor eye. Cut cable to have enough to attach to the anchor. Pull cable tight, attach wire rope clips (2), tighten nuts. Repeat for other side. Attach cable to the side wall studs. Additional eyebolts and Wire Rope Clips and hardware may be required. NOTE: These instructions are for suggested attachment to small shed not located in high wind areas. For more detailed anchor requirements, see the wind zone charts for your area. You may need additional anchors, cable, wire clamps, or other forms of anchor attachments to the shed to meet local or state requirements. Material : Q 235 Carbon steel . 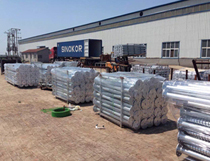 Treatment : powder coated or high dip galvanized . Steel spiral earth anchor , ground anchor to install tree , tent , sheds . ground anchors are in use worldwide , securing famous structures , large dams and retaining walls , holding down underpasses and underground structures ,establish wind turbine towers and preventing landslides . Applications include bridges , cable cars and cable railways , as well as maintaining excavations against ground instability . The anchors provide an effective alternative to large gravity or establish structures. 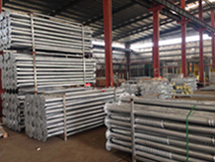 BAODING JIMAOTONG IMPORT AND EXPORT CO., LTD is a professional modernization company,mainly manufacture ground screw ,ground screw pile ,screw pile ,helix ground screw, Helix Piers,Helix anchor ,ground anchor , ground spike , steel picket and other metal products . 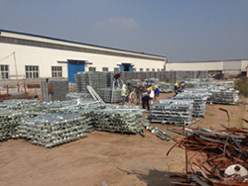 We started making ground screw from 2002 till now ,we have three factories to make ground screw ,ground screw pile, screw pile ,helix ground screw, ground anchor , ground spike , steel pickets ,wood burning stoves, casters ,and other metal products and cast iron products , all of the products exported to USA,Canada , Australia , Sweden , Russia , Japan , South Korea ,Thailand , Belgium , Spain and other countries and markets with high quality , competitive price and fastest delivery . 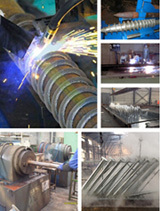 There are advanced equipment imported from Germany and Japan in our factory to make ground screws ,ground anchors and steel pickets & , the whole full automatic production lines, including pipe cutting , pipe shrinkage and welding machine automatic welding machine , automatic helical blade welding machine , automatic blade winding machines &, to ensure the unity and standardization of all the products . All the reputed clients from all of the world are welcome to us ! Give us a chance , leave a forever guarantee for you !